This package includes This item is available in downloadable format only. Since it isn't shipped, be sure before you order that your shipping charges are 0.two hyperbooks — "Spreadsheet Models for Managers" and "Enterprise Spreadsheet Management." 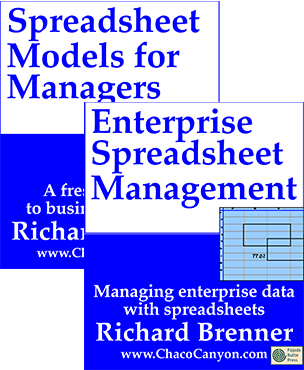 The first is about using spreadsheets to model businesses and business processes, from the perspective of a manager. The second is about using spreadsheets to manage enterprise data, from the perspective of a budget manager or a proposal manager. Both are packed with tips, tools, techniques and dozens of worked problems. They will transform the way you use spreadsheets in your business.